The Holiday Season is almost here... Let's put ourselves in a Thanksgiving mood by folding this turkey. The turkey is my design. The turkey consists of two pieces of paper. The tail is the same "3 Pajaritas" module that is used in the model Passion Flower, with minor modifications. I like to fold this model with paper that is the same color on both sides. The model in the picture was folded with 6" (150 mm) squares of Japanese Tant Origami Paper- 12 Shades of Yellow 6 Inch Square . In the "3 Pajaritas" video instructions I used 6" (150 mm) of regular origami paper, and in the Turkey video instructions I used 9" (225 mm) squares of Pacon Paper Squares . 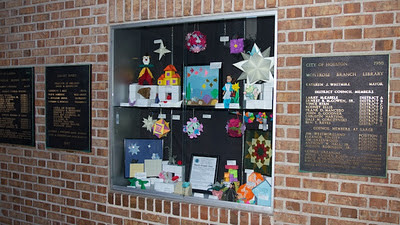 Origami wreaths are very nice decorations for every Holliday. This is the one I made for Halloween. The ring is a Tomoko Fuse's design. The name of the model is "Ring 2", and is available in her book Origami Rings & Wreaths . I folded the ring with 8 squares of 12" (300 mm) Strathmore Colored Art Paper. The diameter of the wreath is approximately 16 ¼" (413 mm), a nice size for hanging it on the door. As decorations, I used the models that I described in my two previous posts. You can find more details about them by clicking here (flower) and here (ghosts). These three ghosts will make great Halloween decorations! 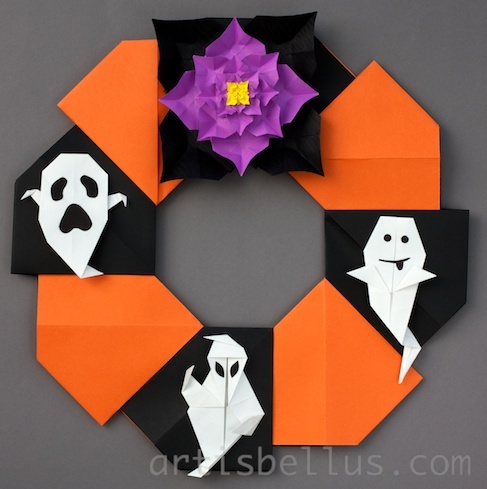 They will look cute and spooky on your walls and windows (especially if you use fluorescent origami paper!). 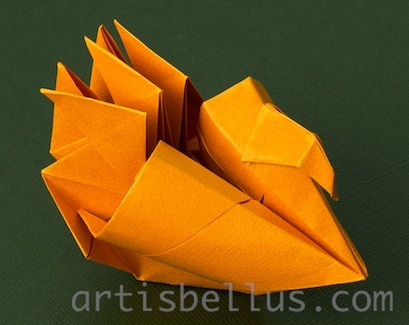 They are very easy and fun to fold. The ghosts can also be given as favors or become a funny folding activity in a Halloween party. 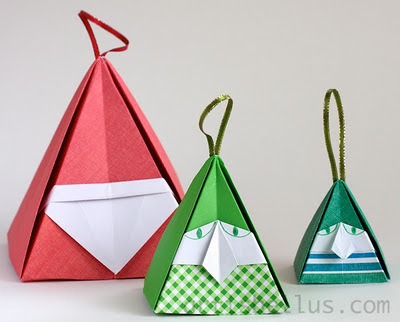 They fold flat, so they are great decorations for scrapbook pages too. 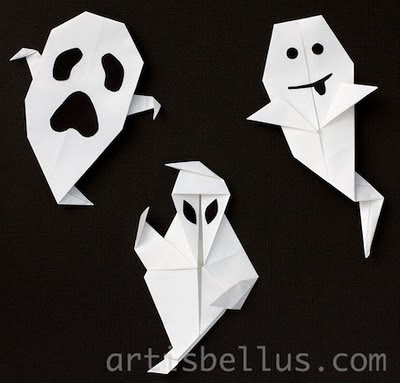 I folded the ghosts with 6"(150 mm) white origami paper, and made the faces with black cardboard cuttings. Copy paper and markers will work great too. Ghost (left), designed by Steve and Megumi Biddle. 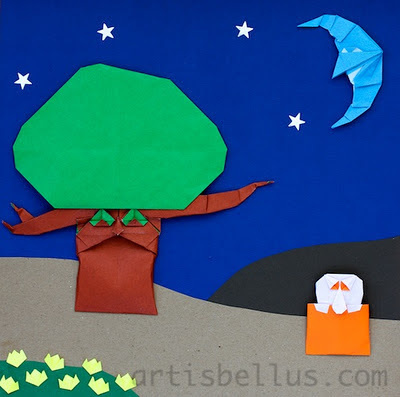 The diagram is available in the book Horrorgami: Spooky Paper Folding for Children . 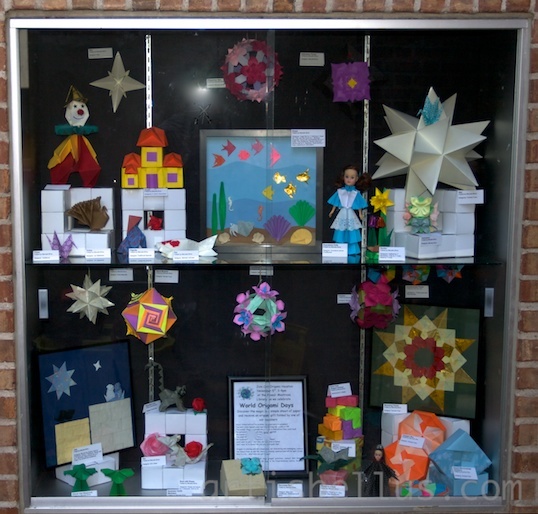 Ghost (center), designed by Paul Jackson . 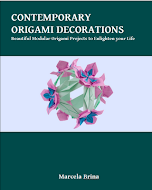 The diagram is available in the book Festive Folding: Decorative Origami for Parties and Celebrations . 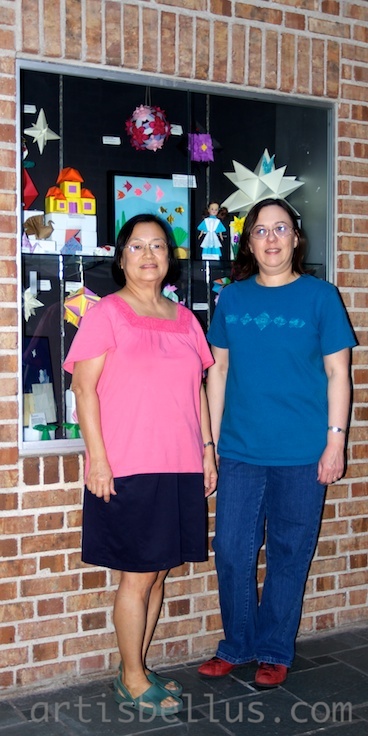 Ghost (right), designed by Fumiaki Shingu. The diagram is available through the following link, on the Origami Club website.